If there’s one holiday that people seem to go home for, it’s the Fourth of July! And Kanab is no exception. People flock into town to celebrate the birth of our country. The Kanab celebration begins with a parade (well, there are other early-morning activities, but we’re lucky to make it to the parade on time). Stampin’ Up! has had a simple float in the parade ever since I can remember, with employees and their children riding on the float and throwing out Stampin’ Up! taffy to the crowd. 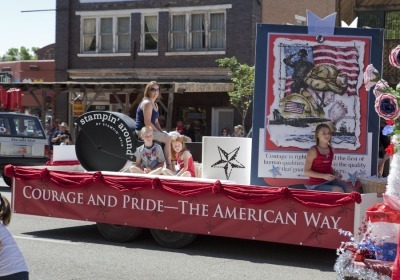 The main feature of the float is usually a larger-than-life patriotic card created with a current set. I love this year’s card—it’s one of my favorites, and we heard a lot of positive comments about it. The parade seemed hotter this year. I was sweating bullets by the end, and I was grateful when my stepfather Paul said that from now on, his job would be to get up early in the morning and stake out a spot in the shade! After the parade we headed over to the city park for the rest of the day. The festivities there are probably similar to ones held around the country: vendors with all kinds of food, drinks, and arts & crafts for sale; games for kids; local entertainment; and lots of visiting. The park is usually packed most of the day, but by 8 in the evening, you can’t hardly go anywhere without stepping on someone’s blanket. The Dutch Oven BBQ starts at 6, and everyone just sits around, eating, visiting, and enjoying the entertainment. This year the mayor began the evening by honoring Sterling’s Dad, U.S. Gardner, for his long-time service to the community. The ceremony included unveiling a six-foot, red sandstone monument featuring a plaque with Uke’s picture and a nice tribute mentioning all his community service. I would have taken a picture, but the plaque had Grandpa Great's name spelled wrong, so I'm going to wait until they correct that and then post a photo. After this touching honor, the rest of the evening progressed with the entertainment; this year's program was titled "Kanab’s Got Talent," and we watched singers, dancers, and musicians as we waited for the main event—the fireworks! They kick off at dark and are the perfect ending to a wonderful home-town celebration! I love the Fourth of July in Kanab; I can’t imagine ever missing it!